Many of my food memories are woven around my paternal Grandmother, and they are normally sweet ones. I refer to her now as Granny Ma to our children as she passed away while I was still pregnant with my first child; but to me, all her other grandchildren and her own children she was simply “Ma”. For a while when we were younger we shared her home and then later she moved to live right beside us. You would pass her door every morning on the way to school and do so quietly, so as not to wake her. On the way home from school you’d often hear a tap-tap on the window and see her beckoning you in to share a cup of tea, watch Countdown and a sneaky treat before dinner. I only remember her making doughnuts once but my Mam tells me that she always made them at Halloween. The time I do remember her making doughnuts it was a weekend and once the word went around to all of our Aunts, Uncles & Cousins that there was a batch on the go her kitchen filled with family members. The smell of warm sugar filled the air, many cups of tea were drunk and we scoffed the lot between about 20 of us. Ma didn’t do things by halves; something I think I’ve inherited. Doughnuts are something that even now I don’t eat without the memories of that day. The thing is that I’m not a fan of hot pans of oil, even if it is a deep fat fryer, when I have such small children in the house and a small kitchen. So I’ve taken a basic doughnut recipe and tweaked it so that they can be baked in the oven which is far safer and probably a little more heart healthy too. 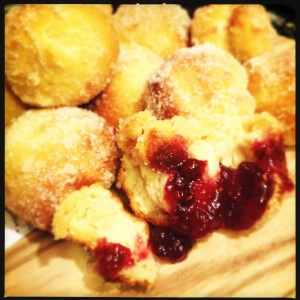 I prefer these jam filled doughnuts without the sugar on top but the kids had to have the real deal. Oh and apologies to my neighbours, as I dropped over a batch of sugar coated doughnuts at their childrens’ bedtime on a Sunday evening. I will try in future to give you advance warning! My name is mud now I think. This recipe will make about 20/25 small sized filled doughnuts. If you would like to make a classic ring doughnut then rather than shaping the dough into balls, then roll the whole dough out and use cookie cutters to get the shape you like. Spray 1 of the bowls with the oil and set to one side. Put the flour into the other bowl and rub in the butter until it goes like breadcrumbs. Add the rest of the dried ingredients (Salt, yeast, sugar) and mix through the “breadcrumbs”. Make a well in the centre and pour in the milk and the egg. Get stuck in with your hands and mix well until it forms into a ball of dough. Remove from the bowl and knead for approximately 15 minutes until it is smooth. Place into the oiled bowl, cut a piece of cling film large enough to cover the bowl & spray the food facing side with the oil as well. This is just in case your dough rises to the top of the bowl it stops it sticking. Cover the bowl with the cling film. Place the bowl in a warm, dry place for about 90 mins. After 90 mins the dough should have risen to about twice the size it was. Knock the dough back and then tear off sections into pieces about the size of an egg. You should get about 20/25 pieces from this mixture. Roll each piece in your hands to get a round shape then place onto the greaseproof paper on the baking tray. Once you have divided and shaped all the dough, cover with cling again – not forgetting to spray the food facing side – and put to one side for another 40 mins. Heat your oven to 180 degrees Celcius. After 40 mins the dough should have risen again, if not just leave for a further 20 mins. Put the 2 trays into the oven and bake for 12-15 mins or until golden (not too brown as they will develop a crust). While they are baking fill a piping bag with a jam of your choice. Melt the butter for decorating – or use a microwave if you like either. Pour the caster sugar for decorating onto a large plate. When baked, remove the trays and using an oven mitt turn each doughnut upside down. Using a sharp knife while they are still hot poke a hole in the base of each. Now pick up the piping bag and fill the doughnuts through this hole. Use the pastry brush to brush the doughnuts with melted butter. Then roll the doughnuts in the caster sugar. The melted butter will make the sugar stick. Thank Jess, yep very, very dangerous! Great memories of Ma! Can’t wait to try the doughnuts – they sound devine! What lovely memories and these sound completely divine! My hubs would scoff them!! Hubby loved them here but was very wary of them as he’s in training! Maybe one for a cheat day.. I love jam doughnuts and they MUST have the sugar coating. Will be trying this recipe as I am also afraid of the vat of boiling oil. Lovely memories too. I love doughnuts, I would really like to try these out. Thanks for sharing. I love your blog by the way! these sound Devine, think I will try them tomorrow. They are fab & very addictive! I prefer them warm myself!